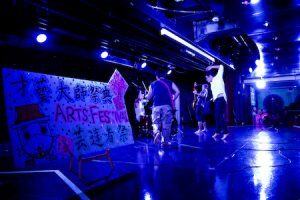 Today all of our artists on board took to the stage to share their talents with us during the Arts Festival. 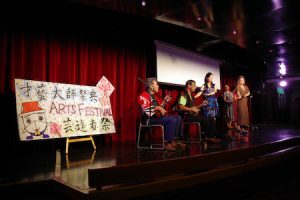 There were over 28 groups who performed including musical instrument performances, dances, songs, and magic tricks. The audience was full of people who came to support their friends. The cheerful sound of the shamisen and claps of the audience filled the venue. 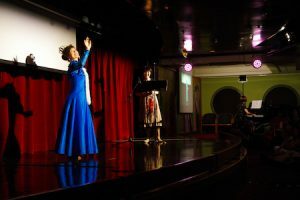 The culture and language of the people on this Peace Boat voyage are different but it feels like the music helps us to overcome borders and become one. The gorgeous costumes from the performance were eyecatching. The elegant dancing combined with the spellbinding harmony of the piano and ocarina, made for a beauty that you couldn’t take your eyes away from. Members from Okinawa came together to perform Asadoya Yunta. 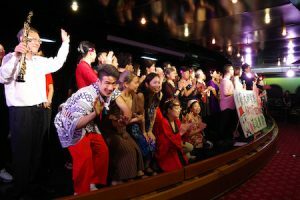 They only formed the group three days ago but it was impossible to tell from the perfect unison of song and dance which received a large round of applause from the audience. 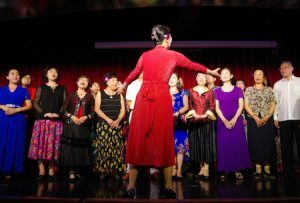 The powerful performance of the Mandarin Choir filled the venue with enthusiasm as the performers neared the end of the show. Everyone was taken over by the music as they naturally swayed side to side creating a feeling of unity. 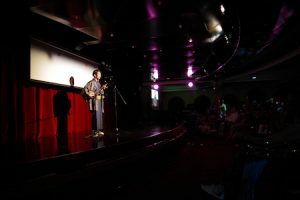 The performers closed out the show to cheers and warm rounds of applause. Everyone who performed as well as those in the audience seemed to be invigorated by the evening. Everytime the crowd was able to feel as one throughout the evening it was an affirmation that no matter how different we all are, we can still communicate heart to heart. This is a place where people are able to express their true selves and be warmly received by the audience. It was an opportunity for everyone to see a new side of each other and become more excited about the remainder of the voyage.